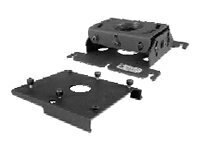 Chief's RPA Series Inverted Ceiling Mount with the exclusive All-Points Security System is the top-selling projector mount in the industry! More RPA Series Mounts are installed in offices, schools and homes than any other mount. Why is the RPA so popular? Because it gives you everything you need for a quick installation, low-profile look and hassle-free projector maintenance.